Belle villa de Naples avec piscine privée. Une belle villa meublée à très élevé modèle (spectacle domicile) normes. Bénéficiant d'un grand sud face terrain paysagé offre soleil toute la journée à la terrasse et la piscine. Situé dans une communauté fermée sécurisé la maison est meublée d'un très haut niveau et est entièrement équipée. Situé à proximité des grands restaurants, des boutiques et jolie »Olde Naples. Une base idéale pour explorer les Everglades, ainsi que les magnifiques plages de Naples et Marco Island. La propriété possède un support complet de la gestion locale. Salle de bains attenante à la chambre principale avec grande douche à l'italienne, deux lavabos et WC séparés. Salle de bains familiale avec bain / douche, lavabos et WC. Notes sur l'hébergement: La Villa est entièrement climatisée et dispose d'un ventilateur de plafond dans tous les principaux domaines de vie avec des télécommandes. Il ya des chaises de plage, un parasol et une glacière pour les visiteurs utilisent. Il ya des vélos à la villa pour les clients à utiliser inclus dans la location. Dehors: Une piscine privée étendue (28'x14 ') avec terrasse carrelée amélioré. Il a une orientation sud pour soleil toute la journée. Meubles de patio et de superbes vues sur le lac. Buanderie: Grande machine à laver et sèche-linge. Planche et fer à repasser. Lavabo. Service de nettoyage / serviettes / / Femme de ménage: Toutes les serviettes et les draps sont fournis (y compris les serviettes de plage). La propriété est professionnellement nettoyé par la société de gestion après le départ de chaque location. Autres: Entièrement climatisé. Il ya plusieurs DVD et des livres disponibles dans le salon. Great location, beautiful gated community! Gary was wonderful to work with. The layout of the home worked well with our three grandchildren. The pool was the best with a beautiful view of the lake! Thoroughly enjoyed our time at this lovely home! At first I wanted to give this home 3 stars but then management came through and fixed things immediately. We had a few issues with ants, but I guess that is common in FL. The garbage disposal broke and leaked all under the cabinet causing a slight inconvenience with us doing dishes but this was remedied the next day. The pool was wonderful expect for all the plastic pool blanket pieces that were falling off due to being an old blanket. There was no pool net either however, management brought one for us. The dishes in the cabinets were not put away clean so we had to wash dishes before we ate which was frustrating coming in late on our first night. With all that the home was spacious enough for our family of 5 plus 2 grandparents. The neighborhood was quiet and friendly. There were plenty of towels to shower and use the pool for all of us. Backyard privacy bushes were nice as well. 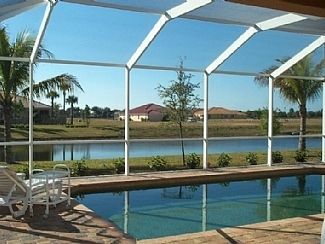 Convenient location to Marco island and Everglades. I am very pleased the management company was able to resolve your concerns immediately and that it didn’t spoil your vacation. Apologies for any dirty crockery that was put in the cupboards....I can only assume they must have come out of the dishwasher not fully cleaned and put away in error. Will make sure this is avoided in future. The new swimming pool blanket was actually in the garage ready to be used.......maybe you missed it. However, we are pleased you enjoyed your stay in our villa. We stayed in Garys place for 15 days and it was the perfect spot for our family of 7 (4 adults and 3 kids age 7, 12 and 15). The house offered everything we needed during our stay, it is spacious and well maintained, settled in a quiet and very nice neighborhood. The kids especially loved the heated pool which allowed them many hours of fun in the water, even though the Florida weather was unusually cold during our stay. The house is just a short drive from grocery stores, shopping, restaurants, beaches and several Everglades airboat tours. Also only 20 minutes to lovely Marco Island and less than 2 hrs from Miami. Gary has been a very accommodating host as well has the property manager on site. We had a fantastic 9 night stay here over the Easter holidays. Very easy to get here from Miami and then straightforward to get to Naples, Marco Island and the Everglades. The house was in a perfect spot with sun all day by the pool, and a lovely development (unfortunately unable to make use of club house facilities, but that didn't negatively impact on our stay). There were a couple of issues with the house, but these were dealt with really quickly by the managing agent, and again, there was no negative impact on our stay. I'd happily recommend this villa to friends and family and look into staying here again when next in the area. Handy for Naples with its beaches, pier and great dining, this property was perfect for a family group, with everyone able to have their own bedrooms. The property, exactly as described, had all the equipment we needed and more and was very clean and comfortable. The pool was great, with plants screening the pool and outside dining area, offering more privacy than shown in the photos. Handy for numerous beaches, the Everglades and the Keys, this was a great property for a relaxing holiday and somewhere we'd be happy to go back to if holidaying in that part of Florida again. 15 minutes en voiture des belles plages de sable de Naples. Marco Island, Sanibel et Captiva Island sont facilement accessibles ainsi. Naples Pier est proche et idéal pour la pêche de la mer - bon amusement. Olde Naples courte distance en voiture. Beaucoup de grands restaurants, boutiques et bars. Il ya plusieurs autres restaurants, magasins et banques à proximité de la villa. Il est un emplacement idéal pour explorer les Everglades ainsi que Naples Zoo, parc aquatique, Naples Pier. Les vélos sont fournis à la Villa d'utilisation des clients. Coastland Shopping Mall offre de grandes possibilités de shopping avec de nombreux autres secteurs de vente au détail. Booking Notes: 25% deposit required with booking. Balance to be paid 10 weeks prior to departure. £250 security deposit required against inventory damage/loss or excessive cleaning. Cleaning cost £90 per booking plus £10 per head for each additional over 4 people. Pool heating available at £90 per week. (only necessary in Winter). Special rates for long term bookings Changeover Day: Changeover day is flexible. Arrive after 4:00pm and depart by 10:00am unless previously agreed with owner. Notes on prices: Prices are per week (7 nights) in GB pounds. Special rates for long term booking. Cleaning cost £100 per booking plus £10 per head for each additional over 4 people. Pool heating available at £90 per week (only necessary in Winter).